The Classified Service is represented by an Employees' Advisory Council (EAC) which is established by the Unified Personnel Act, Florida Statutes 77-642, Section 7. The organization and membership of the Council is established in the EAC Bylaws. 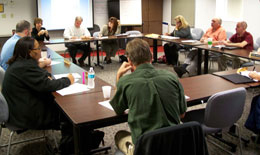 The EAC Council meets monthly and serves in an advisory capacity to the Personnel Board and the Director of Human Resources concerning personnel matters, policies, rules, and regulations affecting Pinellas County employees. The EAC is also charged with developing and recommending ideas related to working conditions, morale, public image, efficiency, employee safety, and employee benefit programs. Perhaps the EAC's greatest responsibility is to speak directly and candidly to the Personnel Board on behalf of the classified employees. The Director of Human Resources acts as a liaison between the Personnel Board and the Employee Advisory Council. The Employees' Advisory Council is responsible for appointing two members of the Personnel Board. The EAC members are elected to two-year terms by their fellow employees. All documents provided in PDF format. 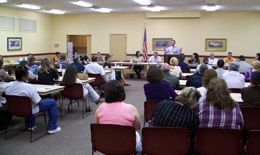 The mission of the Pinellas County Employees' Advisory Council (EAC) is to continually improve the Pinellas County classified employees' quality of work life by interacting cooperatively with the Appointing Authorities, advocating the views of classified employees, and by delivering candid, effective feedback to the Personnel Board on how employees perceive proposed Board actions affecting them. To give generously and conscientiously of our time and effort to ensure that our mission is fulfilled and compatible with the overall policies, rules and procedures of Pinellas County Government. To diligently and dedicatedly pursue our major responsibility of advising the Personnel Board on those significant human resource matters which affect the Classified Service employees. To remain ever aware of the desire of employees to know more about the processes which govern their work lives and to do everything possible to keep them informed about, and involved in, each step of the decision-making process. To conduct all our business in an open and candid manner and to do so without creating adversarial feelings or polarization within the County structure. To continue and broaden our participation in joint management/employee committees to ensure that the feelings and opinions of employees are considered before decisions are made. To conduct ourselves at all times in a manner which will engender the support of employees as well as management.